Stay at Castello di Vicchiomaggio. There has been a castle at Vicchiomaggio since the 9 - 10 C, probably founded by a group of Lombard origin, based on the evidence of the names Littifredo, Imilda and Walfredo mentioned in the earliest documentation. At the end of the 860s, Vicchiomaggio was repeatedly sacked, probably resulting in it being progressively depopulated. In the 1320s, there are reports of abandoned buildings and open spaces. This explains its subsequent transformation, at the end of the 1300s, into a villa belonging to the Florentine Gherardini family and later the Scolari family. The crenellated defensive tower with its small corbelled blind arches and the internal courtyard can be assigned to this period. The tower presents to one side a few round-arched windows and a stone façade made up of remarkably regular courses of local limestone (alberese). 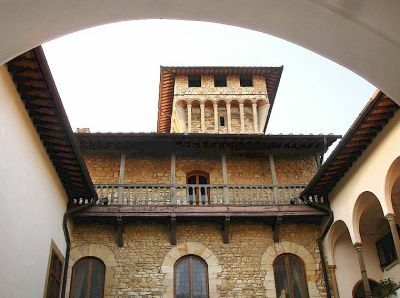 The top of the tower has been completely reconstructed in neo-gothic style while there remain only a few traces of the external wall of the castle because the major part of it has been completely encased within the walls of the villa when it took on its current appearance during the modern era. The window corbels, the ashlar work of the main doors and the quoins in pietra serena contrast with the white colour of the façade, conforming to typical 16 C taste and conferring great elegance upon the structure as a whole. In 1964 the Vicchiomaggio was bought by Federico Matta who originally came from Tonengo near Asti in Piemonte where he was born in 1891. He emigrated to London and in 1921 set up a wine import business. The company became the largest Italian wine specialist in Britain, importing French and later Italian wines for the restaurant trade. The Vicchiomaggio estate was in a very poor condition but a thorough replanting programme put Vicchiomaggio back among the elite of Chianti estates. Federico's son, John Matta, has been running the estate with his wife Paola since 1982 and the quality of Vicchiomaggio wines has continued to improve. John Matta was named Italian Winemaker of the Year in both 2002 and 2005 at the International Wine and Spirit Competition. Vicchiomaggio is consistently classified amongst Italy’s top estates and in 2002 John Matta was awarded The Tasca d’Almerita Trophy for “Best Italian Producer of the Year”. This was followed by the IWSC 2005 accolade for “Italian Wine Producer of the Year” with the 2003 La Prima Chianti Classico Riserva winning the “Carpineto Trophy For the Best Sangiovese” in the same competition. Vicchiomaggio offers wine-tasting and has a good restaurant. 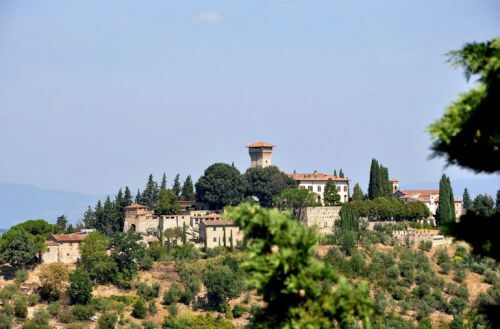 It can easily be reached by car or SITA bus from Florence or Greve in Chianti.